There is a real danger on the horizon if we allow Texas to be handed over to the democratic party. So much more is at stake than losing a large sum of electoral votes. 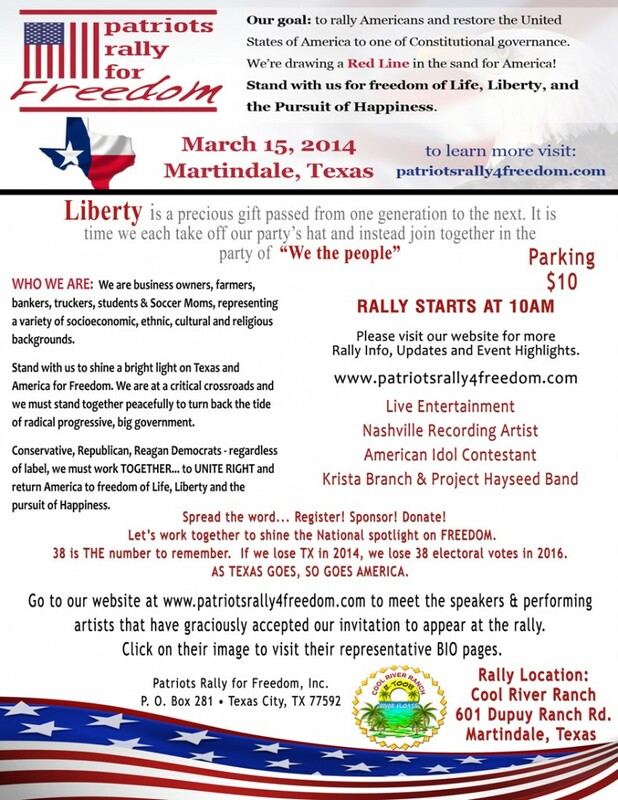 Freedom and Liberty are worth fighting for, and that’s what the Patriots Rally For Freedom is all about. Coming up on March 15 outside of San Marcos, TX is a rally to educate, motivate and activate the grassroots all over America. Speakers and performers are going to be gathering together at this event from all over and from all walks of life. Wayne Dupree (News Ninja), Ken Crow (co-founder of Tea Party Community), Katrina Pierson (Congressional Candidate), Project Hayseed and Krista Branch are just a few of the stunning line-up that has been prepared. Please show your support for this rally by getting registered to attend, or make a donation to protect and preserve the red state of Texas by clicking HERE.